An amateur video of the space shuttle Challenger explosion shortly after liftoff has surfaced over 25 years after the tragic event when seven astronauts lost their lives. The rare film of the 1986 Challenger explosion was taken by Jeffrey Ault of Orange City, Florida. It is perhaps the only amateur recording of the event on film and it has been made available exclusively to The Huffington Post. The newly released video offers a closer and more intimate view of the tragedy than have other video reports previously released by the news media. Jeffrey Ault was part of a live audience gathered to watch the Challenger take off from the Kennedy Space Center, less than 10 miles from the launch site. He shot the video on his Super 8 home video camera, and it sat for 26 years in a box in his house. “I was hoping to see an event that I would remember for the rest of my life,” Jeffrey Ault told the Huffington Post in an email. The initial explosion happens at around the 1:20 mark in the video. And it’s clear the spectators don’t grasp what is happening right away, with one person in the background whispering: “Oh, that’s beautiful,” as the shuttle’s contrails split in two and begin descending back toward the ground below. And finally, at the 2:50 mark, Steve Nesbitt can be heard announcing that the Challenger has exploded. The video ends shortly after that. 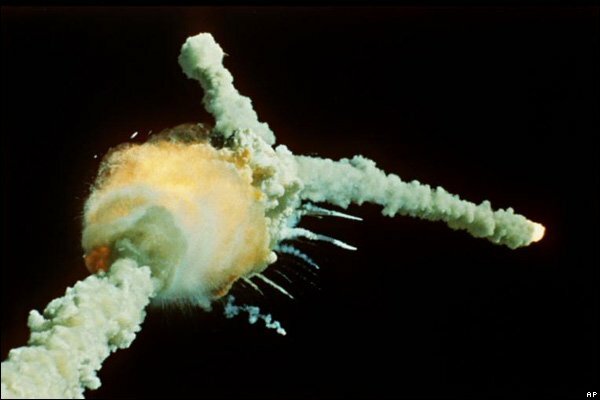 The Challenger accident brought all U.S. shuttle flights to a halt and ignited a debate at the time about whether the shuttle program should even continue.